As I read through chapter 5 and the accompanying appendix, I realized I needed to look long and hard at my own reading habits before I thought about instilling any reading habits in others. When I read over Form C.2, I was left with questions such as: Do I make a reading plan? How do I choose books? Do I stick to certain genres? Below are my thoughts on these questions as well as a few ideas on ways I can instill these habits in my primary students. What gaps do I have in my reading? My reading preferences change with the seasons. In the summer time I enjoy escaping with realistic fiction. In recent years I have also begun to enjoy some historical fiction. I read lots of professional articles and books year round, but I noticed that during the school year I tend to read shorter pieces and don't try to tackle an entire book. Rarely do I read nonfiction. This makes me realize I need to expand my genres in reading as well as think about trying to diversify during the school year. I will find the time to foster this habit. What is the student's plan for future reading? and How do I select books? These related questions made me think that I rarely have a plan for my reading, short of stacking books next to my desk all year long in the hopes of reading them in the summer. My summer reading is typically based on friend recommendations. Last year I excitedly created a Goodreads account and thought about following a few key people to give me ideas for books, but that got left by the wayside. Reading Donayn's book remanded me about my account and gave me renewed excitement to try it out again. While visiting a friend recently, I was given a list of great book ideas but I had no pen with me. Having Goodreads to note my ideas on my phone app was just the ticket to recalling the titles when I needed them. I had the beginnings of a plan for my summer reading and it felt good when I finished one book to be able to jump right in to the next page turner. How can I foster greater commitment and selection in the classroom? Since I had such success with the use of social media for my personal reading, shouldn't I try this in a classroom? Could I connect with other primary classrooms to see what they are reading, maybe a take off on the idea of: It's Monday: What are You Reading? and share a few posts with the class by projecting the site on the board and getting children excited about a variety of books to read next. Maybe I also need to create a Goodreads shelf for the classroom? The readings this week seem to have left me with more ideas to ponder, but I believe that's what a good book does, causes one to ponder. 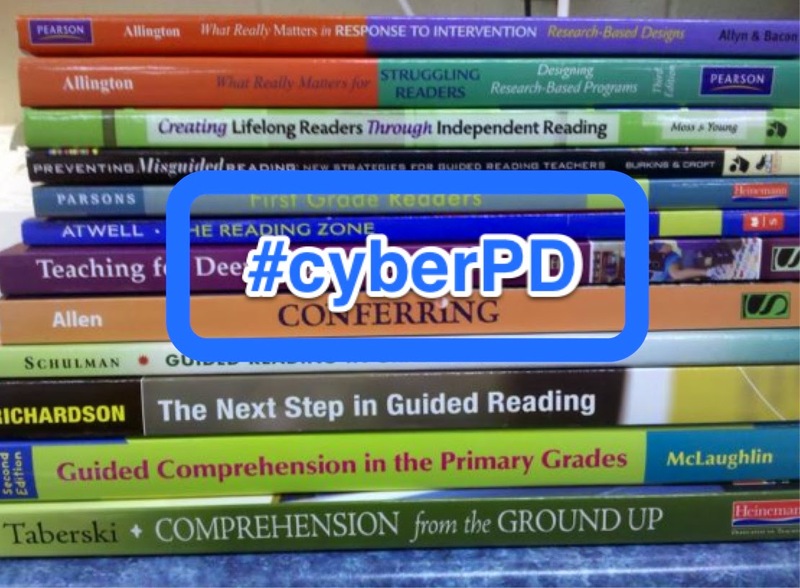 Thank you Donalyn for a fabulous book, and thank you to Cathy Mere, Laura Komos, and Michelle Nero for hosting #cyberpd 2014. I love your idea about keeping a list of books you had shared in class and having your students help decide the genre. What a great way to begin those discussions! I would like to try a spin-off of your idea. With each of our read-alouds, we discuss the character trait we think was most prominently shown throughout the book and then post a copy of the book cover with a corresponding sign/heading. This year I'd like to add your idea of having students decide the genre and coding each of the book covers as well. Wish I had thought of it sooner - thanks! I also have a Goodreads account that I have not been very good about keeping current. Like you, my interest was also renewed when I read how Donalyn uses Goodreads to keep a "to read" list. I'm excited to try it out since I've had problems losing some of my lists on my Notes page on my phone. Thanks for sharing your thoughts and helping me reflect as well! Jill, Thank you for your comments. Love your spin off idea. Seems much more visual than mine. Pictures of covers may be better for the younger ones as well. Might have to use online tools for space purposes. Thanks Katie - I corrected my mistake. How embarrassing! Thank you for reminding us of the importance of considering the way what we know about our reading lives can help us think about supporting readers in our classroom communities. It was interesting to me the way your reading changes based upon the time you have and where you are in your life. Your reading is shaped by what is important to you. I think we have to consider this with our students too. I always talk to my students who are busy with after school activities about considering this when making book selections. If you have practice, you might choose a lighter read than on a night when you are free to read for a longer period of time, for example. Like you, I have found keeping my books on a social media site helps me to keep track of books recommended, find new selections, and keep a reading plan. I use Shelfari for my reading as I'm a sucker for the visual appeal of a shelf. ;o) I also use Shelfari with my classroom. We keep track of the books we read aloud together, and many families choose to make shelves during the school year. This is one we I found to connect to other primary classrooms to find out about the books they are reading. We also use Twitter and class blogs to discover new titles. Thanks for joining the conversation. I've enjoyed reading everyone's reflections and considering new thinking.